Published: Nov 9, 2012 to ? 25-year-old Moriyama Mikuri has an advanced degree, but has had no luck finding a permanent position. She's been living with her parents and doing temp work, and her latest job is doing housework for a single salaryman, Tsuzaki. Mikuri longs to start a career in her field, and her Aunt Yuri, who has had success in her professional life and who regrets never marrying, also wants Mikuri to find love. When Mikuri learns that her parents are planning to move to the country, she realizes her time is running out. She still has had no luck starting her career, so it seems she will have no option but to move to the country with her parents. She finds another option in moving in with Tsuzaki, who doesn't want to lose his housekeeper. To deal with the scandal of their living together, they get married—though just on paper. Now Mikuri starts her unusual new life, as a woman looking to start her career and as a new 'wife'! 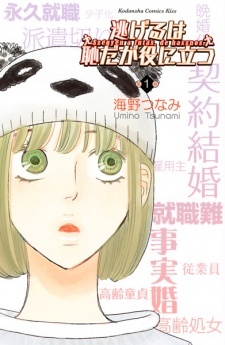 Nigeru wa Haji daga Yaku ni Tatsu won the 39th Kodansha Manga Award for the shoujo category. The manga was adapted into TV drama series in 2016. 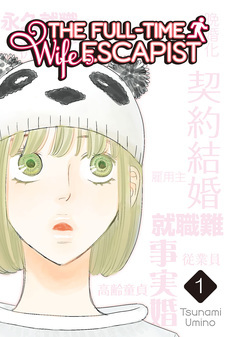 The series has been published digitally in English as The Full-Time Wife Escapist by Kodansha USA since February 28, 2017. The Full-Time Wife Escapist, AKA NigeHaji is a work that isn't what it seems. The first 2 volumes focus on making the characters look shallow and unlikable. The main woman comes off as a whore and the 2 guys are basically having a content over which one of them can cuck themselves harder. After this, we are shown what they hide underneath their shells and what type of personalities do they actually carry. The series focuses on 4 people. Young woman who is lost in life. Young man who is disappointed in women. Over 30 years-old man who has never been in a relationship, and a woman on her 50's who has remained virgin her whole life to a point where she can't have her own kids anymore. The pairings in this series are decided very early on - and unlike almost every single other romance - the real story begins where others end. The main focus from this point on is within building a solid relationship and learning to live with eatch others as a couple, as two people. The content offered is rarity. Subjects that are not present in almost any animanga nor even in other forms of entertainement. We get to see content such as two people studying the best way to comfort each others with the power of hugs. Perhaps more accurate genre for NigeHaji would be "relationship" instead of "romance", but then again, it's not like many works such as NigeHaji exist. I will refer to it as an essential read for the fans of realistic romance. The heroine is not typical and she’s great. She doesn’t jump into conclusion like other heroines. Instead she analyzes situations and uses her imagination to solve problem. She puts the psychology she studied in use but that doesn’t mean she’s not fixated on some problem of her own. There is a running joke among my friends, you put a "warning: adult content" image in a post and then talk about your work, children, spouse, health or about the lack of any of those things. The joke being that most actual adult themes are not that thrilling, just the kinds of things that happen in a normal life after the adventures of the 20's pass. This manga is an adult manga. The story can be read either as a work-related or as romance, but either way, it's an adult story, its worries are not easy to understand for someone young and the plot is not of the mind-blowing sort. Someone is looking for a job and gets a job, someone is trying to find love and love finds them. All very normal and extremely exciting for someone that never sees that kind of story in the wild (most josei and seinen manga that I have access to are either about children and teens or set in fantastic, science fictional places. Even the adult romances are usually unrealistic). Other than the blatant realism, what actually makes the series are the characters: all multifaceted people with opinions, lives and interests. Their conversations, their relationships and the way their lives intertwine are extremely compelling. I also enjoyed the art, because its simplicity serves the story so well, without overshadowing or short-selling anything. I specially like how each character has a wardrobe (not the same clothes all the time, but a handful of clothes that they switch around) and how people look different when they've just woken up. Those little details, coupled with an extremely tight narrative and paneling* made me actually miss this manga after I finished it. It's like missing talking to your last job's coworkers, a strange kind of nostalgy. So I really recommend this story. That is, if you're an adult and interested in other people. * I actually feel nostalgic for good storytelling in manga because so many mangaka take 160 pages in a single fight scene, date or impact event.